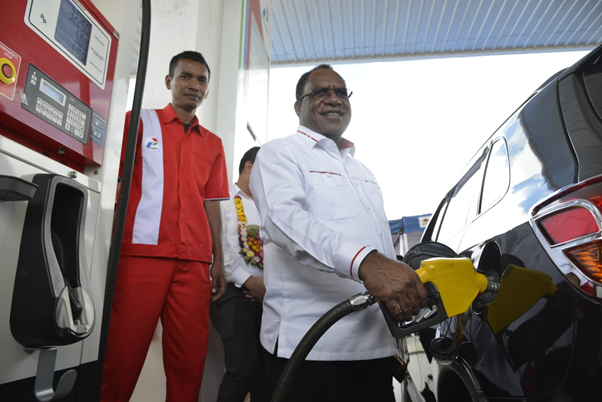 JAYAWIJAYA - Two fuel pricing agencies One Price was re-inaugurated by the Government, Kompak Public Fuel Filling Stations (SPBU) in Wamena, Jayawijaya Regency and Kompok Bokondini Gas Station (SPBU) in Tolikara District, Papua Province. People who previously bought fuel at a price of IDR 50,000 to IDR 70,000 per liter can now enjoy the same price as in other regions, namely IDR 5,150 / liter for diesel fuel and IDR 6,450 / liter for Premium. With the addition of the operation of these two gas stations, the BBM One Price program has reached the 79th point. Previously in 2017, 57 dealers had been built. In 2018, a total of 73 government agencies will be built. The amount is divided into 67 provided by Pertamina and 6 built by AKR. "We will continue to pursue the figure (BBM point of one price) so that people in all regions can enjoy BBM One Price," said Director of Oil and Gas Downstream Business Development at the Ministry of Energy and Mineral Resources, Yuli Rachwati in her remarks at the inauguration centered at Kompak Gas Station in Wamena, Jayawijaya Regency , Saturday (8/9). The presence of Kompak gas stations in the central mountains of Papua was welcomed by the people of Wamena and Bokodini. Jayawijaya Regent Wempi Wetipo revealed that the people who inhabit the central mountains of Papua are now helped by the presence of the One Price BBM channeling agency in their region. "People used to buy fuel at a price of IDR 50,000 - IDR 70,000 per liter. With easy access to fuel for the community, the economy of the community is also becoming more fertile. Hope in the future, the BBM quota for the Wamena region can be reviewed, considering the central mountains of Papua make this point as the center of the economy, "said Wempi. In line with the Regent of Jayawijaya, Tolikara Regent's Expert Staff Edie Rante Tasak, who was present at the occasion, expressed his hopes regarding the growth of the central mountains of Papua, one of which was marked by the presence of BBM One Harga. "Currently the Papua crossing is being built, in the next few years, from one region to another can use land travel. It is hoped that the central government will continue to pay attention to the development of the Tolikara region," said Edie representing the Tolikara Regent.